Happy Holidays, boaters! If you're in search of spirited gatherings, look no further. Deck the spars and head to these harbors to light up your long winter nights. Nothing kicks the holiday spirit into gear like an evening with friends and family as your harbor sparkles with holiday cheer! In the weeks leading up to Thanksgiving and throughout December, community members from towns, counties, marinas, and yacht clubs around the country have been planning a little extra sparkle to kick off the holidays. Below is an ongoing list of the 2018 haborside events to ring in the holiday cheer. November 29 - December 9: Kennebunkport’s 37th Annual Christmas Prelude is a full week long event with lots of holiday cheer. There are multiple events throughout the week but Santa’s arrival by lobster boat has always been one of the favorites. Check out the week long celebration and join in on a Christmas House Tour, Trolley Rides, the Tree Lighting Ceremony, the Lobster Trap Tree Lighting, Pancake Breakfasts and so much more. November 30 - December 2: Christmas by the Sea in Camden. A December tradition that kicks off the holiday season with tons of great events. Enjoy the Christmas by the Sea + Sea Parade on Friday, along with the Community Tree Lighting Ceremony at Camden Harbor Park. December 1: Boothbay Harbor is not without its winter festivities, ever! Join in with celebrating the season in old-fashion holiday style with the Harbor Lights Festival. The Festival offers a variety of activities for young + old alike and will put each and everyone in the holiday spirit. The Boothbay Harbor Festival of Lights officially starts at 5 PM. However, holiday events will be taking place all day long. December 7 - 9: Christmas by the Sea 2018 in Ogunquit. This holiday celebration weekend features a tree lighting, Christmas parade, beach bonfire, polar plunge, fireworks, caroling and much more. December 7 - 9: The 25th Annual Sparkle Celebration in Freeport. This is one of Maine’s most popular holiday celebrations which kicked off with a Parade of Lights down Main Street and then the lighting of the Christmas tree. The fun will continue throughout the weekend with loads of free events + activities including visits with Santa, horse drawn carriage rides, free holiday movies and a Tuba Christmas Concert. December 1, 2, 8, 9, 15, 16 + 22: The 39th Annual Candlelight Stroll anchors the Vintage Christmas in Portsmouth. The historic seaport of Portsmouth is definitely worth a holiday visit. Each weekend in December, the grounds at the Banke Museum are lit with the glow from hundreds of lights while the museum’s historic homes boast festive decor for the holiday season. December 8 - 9: The 22nd Annual Inn to Inn Cookie Tour in the White Mountains. Participants will not only tour inns decked in all their holiday best, each offering signature holiday cookies and candies, but they will also receive recipes from each inn in a Holiday Recipe Cookbook. November 19: The Annual Lighting of the Columbus Park Trellis at 5 PM. The Mayor turns on the 50,000 glowing blue and white lights along the 260 foot trellis and 14 nearby trees! November 26: Copley Square Tree Lighting from 5 - 6 PM. November 27: Massachusetts State House Tree Lighting starting at 5 PM. November 27: Faneuil Marketplace - Giant Christmas Trees and Blink! Light Show. This is by tradition the biggest decorated tree in the Northeast. Lights will go on during the ceremony between 7:30 - 8 PM. November 29: The Boston Common Holiday Tree Lighting from 6 - 8 PM. November 30: The North End Tree Lighting from 6 - 8 PM along with the North End Holiday Stroll. November 30 - December 2: Stockbridge Main Street at Christmas Festival. The town of Stockbridge becomes a magical, wintery New England setting during the Main Street at Christmas Festival. Decorated with holiday cheer including beautiful wreaths and festive lights. The weekend hosts a wide range of activities including holiday readings, house tours, caroling and even a holiday concert. November 30 - December 2: Christmas Stroll on Nantucket. This year marks the 45th Annual Chamber Christmas Stroll with a weekend festival jam-packed with holiday events. Enjoy the Annual Festival of Lights, the Nantucket Christmas Carol, and even a Wreath Workshop Stroll. November 23: Happening the day after Thanksgiving, the Newport Harbor Illuminated Boat Parade 2018 begins at 6:15 PM and goes till about 9:15 PM. The decorated boats will rendezvous at the Goat Island Causeway and travel clockwise around Newport Harbor. The judges for the boat parade will be located at the Newport Yacht Club judging boats on best decorated sailboat, best decorated powerboat, best decorated fishing boat, and most team spirit. November 25: Lighting of the Lighthouse. Gurney’s Newport is hosting a lighting of their historic lighthouse complete with carolers, spiked cider + hot chocolate along with some live music. November 30 - December 1: Historic Wickford Village celebrates the holiday season during their 32nd Annual Festival of Lights celebration. Throughout the weekend, there will a town tree lighting, Santa’s arrival at the Town Dock, hayrides with Santa, concerts, an Elf Parade, breakfast with Santa, and much more. December 1: The Bowen’s Wharf Tree Lighting. Enjoy an enchanted evening of caroling, Christmas fun, the Tree lighting and meeting Santa & Mrs. Clauses arrival. November 24: Just like Santa Claus is coming to town, the Mystic’s Holiday Lighted Boat Parade will also be coming to town. Head over to the Mystic River Park to watch the lighting of the Christmas tree at 6 PM along with Santa’s arrival by boat. Then check out the 17th Annual Holiday Lighted Boat Parade by 6:20 PM. November 25: Kick off the holiday season with Trees in the Rigging Community Carol Sing + Boat Parade in Essex. Stroll down the lantern-lit Main Street. After, watch a parade of vessels dressed out in holidays lights along the Connecticut River. November 13 - December 21: Thousand Islands Museum hosts the 24th Annual Festival of Trees. November 23: Huntington Lighthouse Parade of Lights is a lighted maritime extravaganza off the shores of Huntington Harbor. This is the official kick off to the holiday season in Huntington. Head over to the harbor to view the parade from anyway. November 24: Connetquot River Boat Parade and Fireworks. The vessels begin their parade at the View restaurant at 5:30 PM and proceed to the Snapper Inn & then back again. Fireworks will follow the parade at 7 PM. December 1: The Freeport Nautical Mile of Lights Holiday Boat Parade. The parade begins at 7 PM. November 16 - December 30: Skylands Christmas Light Show + Village. This Christmas light show features more than 2 million dazzling lights on a mile-long drive-thru course. It is a must see holiday attraction for the family! November 16 - January 1: Christmas in Cape May. The seaside town of Cape May is transformed into a Dickens village for the holidays with garlands of fragrant greens and twinkling gaslights! November 23: Holiday Express Concert + Town Lighting. Kick off the season with the annual Holiday Express that will be rocking the streets of Red Bank. November 24: Holiday Harmonies. Enjoy traditional carolers, choirs, brass bands, handbells, rock, folk and jazz musicians bring the holiday tunes to the sidewalks of Red Bank. December 1 - 8: Festival of Trees in Chester. A community celebration featuring a spectacular display of holiday trees in a winter-wonderland setting. The trees are individually decorated by families, businesses, and civic organizations. December 5 - 8: The 38th Annual Solomons Christmas Walk. Celebrate the spirit of the holidays in Solomons festive Chesapeake Bay Village. The lighted boat parade will be taking place on December 8 at 6:15 PM. December 8: The Eastport Yacht Club Lights Parade. A beloved Annapolis tradition, happens on the water of the Annapolis Harbor! 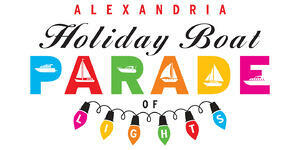 December 1: Alexandria Holiday Boat Parade of Lights 2018. This is a favorite holiday celebration in Old Town Alexandria. Festively decorated pleasure boats light up the sky along the Potomac River including dozens of powerboats, sailboats and the District's fire boat. December 1: Yorktown Celebrates Christmas - Lighted Boat Parade from 6 - 8 PM. Pre-parade festivities start at 6 and include caroling around a beach bonfire, a musical performance, and complimentary hot cider. December 9: The 28th Annual Downtown Hampton Lighted Boat Parade from 6 - 9 PM. Enjoy an after party and award presentation at 8:15 PM. December 1: The District's Holiday Boat Parade from 6 - 9 PM. Join in to celebrate the holidays and see the beautifully decorated boats pass by! There will be a cookie decorating + craft your own boat table as well as fire pits, and a lighted Christmas Tree. December 1: Crystal Coast Christmas Flotilla. The decorated boats can be seen at 5:30 PM on the Morehead City waterfront and at 6:15 PM on the Beaufort Waterfront. The Flotilla is open to boats, yachts, oars, kayaks and commercial vessels decorated for the season. December 1: The 2018 Christmas Flotilla at the Carolina Beach Boat Basin in Pleasure Island. The flotilla begins at 6 PM. December 8: The 37th Annual Holiday Parade of Boats will be held in Charleston Harbor from 5 - 7:30 PM. December 9: The 2nd Annual Bohicket Christmas Parade of Boats from 6 - 9 PM. Head on down and enjoy the Charleston Coastal Choir singing Christmas Carols with Hot Chocolate + S'mores by the fire. November 24: The Savannah Boat Parade of Lights. Enjoy a Christmas parade, Savannah style! There will be over 40 lighted vessels parading both sides of the waterfront, accompanied by live music performances, tree lighting ceremony, and a fireworks extravaganza. December 7: The 10th Annual Lighted Boat Parade in Tybee. Boats will be festively floating down the Black River during high tide for the 9th year in a row. They will be starting down the river around 7 PM. Apollo Beach Lighted Boat Parade from 6 - 9 PM. Tampa Sailing Squadron will once again be opening their doors to the community for the parade and awards ceremony at their Clubhouse. There will also be hamburgers, hot dogs + soft drinks available for purchase. The annual Lighted Parade of Boats + Santa’s Workshop on St. John’s River in Astor, Florida at 6 PM. The Blackwater Yacht Club will be collecting toys for the children of Astor. The 30th Annual Fort Myers Beach Christmas Boat Parade. The 24th Annual Palm Beach Holiday Boat Parade at 6 PM. The parade navigates up the Intracoastal Waterway from North Palm Beach to the Jupiter Inlet Lighthouse. Mount Dora Lighted Boat Christmas Parade starting at 7:30 PM. Key Largo Boat Parade. Enter your boat or watch from land! The 33rd Annual BCYC Gulfport Christmas Boat Parade. Starting at the Gulfport Municipal Marina the boat parade will sail throughout the Boca Ciega Bay. 28th Anniversary of the St. Lucie County Christmas and Winter Boat Parade. The parade route begins at Taylor Creek around 6:30 PM. Martin County Christmas Boat Parade begins at 6 PM on the East Side of the Jensen Beach Causeway. The Boot Key Harbor 22nd Annual Christmas Boat Parade. The Panama City Boat Parade was originally scheduled for December 8 but the City is still rebuilding from the aftermath of Hurricane Michael. Keep checking back for our updates! The 56th Annual Greater Pompano Beach + Lighthouse Point Holiday Boat Parade. This is the longest running boat parade in the nation and for the first time ever is going to be on a Friday night! Schooner Wharf Lighted Boat Parade at 8 PM. Watch as decorated boats parade around the Key West water. The Seminole Hard Rock Winterfest Boat Parade will take place on the New River in downtown Fort Lauderdale. The parade takes approximately 2 and ½ hours to view from one location. Private boats to the giant showboats and corporate megayachts will be adorned with hundred of thousands or lights, music, entertainment, decorations, musical groups, etc. The 2018 MOC Boat Parade. The Cape Coral Christmas Boat Parade. Enjoy beautifully decorated boats from 4 till 10 PM. Winterfest Boat Parade is a one day event at the Winterfest Inc in Fort Lauderdale. The event will feature hundreds of thousands of lights, music, and entertainment. 42 Annual Boca Raton Holiday Boat Parade from 6:30 - 8 PM. Enjoy the parade from the Red Reef Park, the Wild Flower Property or Silver Palm Park. Bridges will be held in the up right position for approx. 45 minutes for the boat Parade. The Punta Gorda Christmas Boat Parade. Downtown Tampa Holiday Boat Parade from 6 - 8 PM. December 1: The 33rd Annual Morrow Bay Lighted Boat Parade from 6 - 8 PM. Watch as the motorized fishing, leisure and yachting community of Morrow Bay take to the water after decorating their boats with amazing lights and holiday cheer. Take a seat anywhere on the waterfront for your front row view. December 1: 24th Annual Santa Maria Parade of Lights. Focused on the holidays and spirit of giving, the parade is a family, friendly event and all are welcome. December 1: The 2018 Estuary Lighted Yacht Parade. Starting about 5:30 PM the boats will proceed down the Alameda side past Oakland Yacht Club where the judges will be. December 8: The 72nd Annual Naples Boat Parade 2018. Large boats decorated with lights parade along the peninsula at 6 PM while small boats float by around 6:30 PM from the Appian Way Bridge. The large + small boats will go in opposite directions. The best spots to view the parade are bridges and waterfronts along the canals in Naples Island. December 8: 53rd Annual Parade of Lights at Channel Islands Harbor taking place from 12 - 8 PM. December 8: Marina del Rey Holiday Boat Parade 2018. The Marina del Rey Boat Parade is annually held in North America’s largest man-made small-craft harbor. The festival begins with Snow Wonder, which takes place in Burton Chace Park from 12 - 6 PM. December 8: The King Harbor Holiday Boat Parade in Redondo Beach from 4:30 - 11:30 PM. Decorate your boat or paddle craft and help make the 2018 boat parade a huge success. If your not sure how to go about decorating your boat, have the Sea Scout elves help you out! Boat entries in the parade also include two meal tickets. 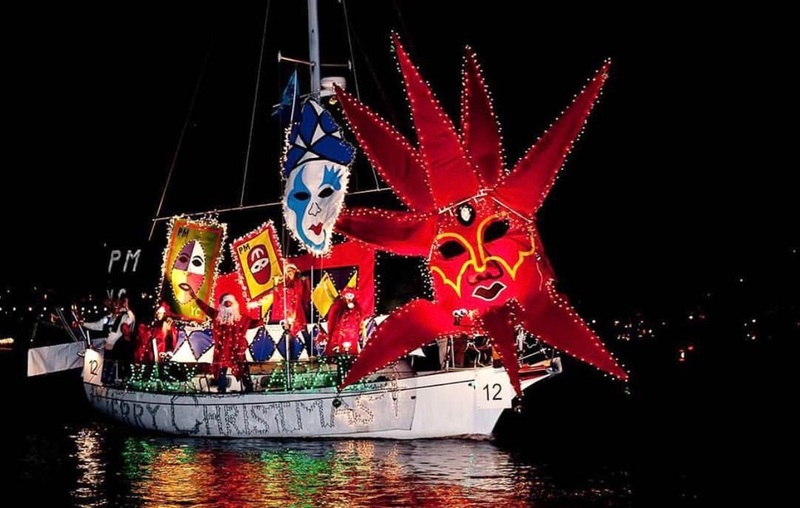 December 9 & 16: The 47th Annual San Diego Bay Parade of Lights. A time-honored holiday tradition brought to the community by the San Diego boating community. December 14 - 15: Ventura Harbor celebrates the season with the 42nd Annual Holiday Boat Parade of Lights. December 15: San Francisco Fisherman's Wharf Holiday Boat Parade. More than 60 boats festooned with lights and holiday decorations will parade along the waterfront, starting at PIER 39. December 19 - 23: The 110th Newport Beach Christmas Boat Parade and Ring of Lights. As the Newport Beach Boat Parade moves it way through the Newport Harbor, one is able to see the parade from almost any place on the shore free of cost! November 16 - 18: Christmas by the bay. Kick off the holiday season early in Sturgeon Bay with a tree lighting ceremony, live music, free horse-drawn wagon rides, a holiday parade and even a breakfast with Santa. November 18: The Milwaukee Holiday Parade. This cherished holiday tradition features marching bands, floats, giant helium balloons, local celebrities, costumed characters, and a featuring of Santa. November 23 - 24: Capture the Spirit in Sister Bay. Enjoy events like the Holiday Lighting Ceremony, Christmas Cookie Decorating and a trip to Village Hall. November 23 - 24: Holly Days. A celebration of the holiday season with Breakfast with Santa, a children's Elf Hunt, Mistle Dough shopping contest, horse-drawn wagon rides, caroling, and even a tree lighting. November 16 - 17: The 27th Annual Mile Lights Festival in Chicago. Help ring in the 2018 holiday season with two days of free, family-friendly activities. There will be a tree-lighting parade on Saturday. November 30 - January 6: Winter WonderFest at Navy Pier. A beloved annual Chicago event which features over 170,000 square feet of carnival rides, giant slides, holiday-themed activities, and Indoor Ice Skating Rink. November 16: The 24th Annual Luminary Festival. Stroll through the candlelit streets as 1,000 luminaries light your way to shop around in downtown St. Joseph. November 22: America's Thanksgiving Parade in Detroit. This is the country's oldest and most celebrated Parades. November 27: Downtown Holland Parade of Lights from 6:30 - 7:30 PM. Bermuda - December 8: The holidays get a whole lot brighter when dozens of boats decorated with brilliant lights cruise into Hamilton Harbour during the Hamilton Harbour Christmas Boat Parade. The parade will take place starting at 6:30 PM. Bahamas - December 1: Freeport’s Nautical Mile of Lights Annual Boat Parade. Before the boat parade begins enjoy a Tree Lighting at the Esplanade. Then head on over, to the boat parade starting around 8 PM. Saint Thomas - December 21: The 19th Annual Lighted Boat Parade. All blue water + charter vessels in the area are welcomed to enter their vessels into the annual parade. Each one that enters will receive a free overnight slip at Crown Bay Marina. If you prefer to watch instead, boats will be judged based on the best holiday theme, most original, and the best use of lights! Know of holiday events or illuminated boat parades happening in your area? 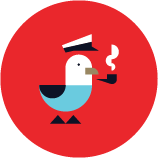 Let us know: Tweet at us, message us on Facebook, or email amanda.jones@dockwa.com.